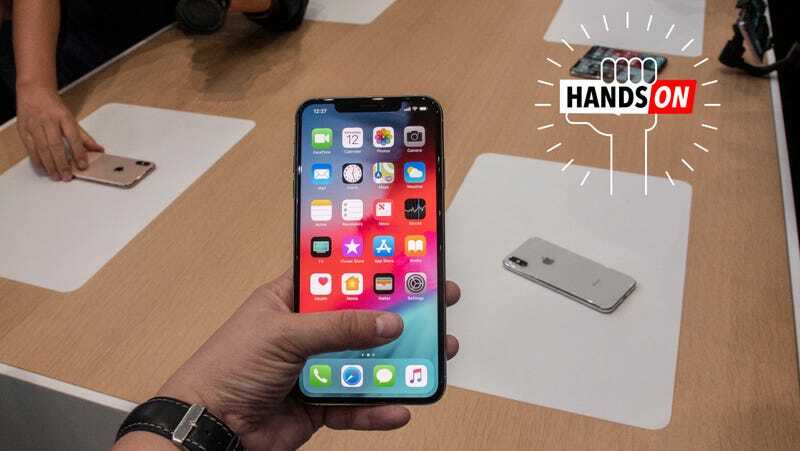 Just how big is the iPhone Xs Max? Honking huge. Despite having near identical dimensions to the iPhone 8 Plus, the iPhone Xs Max feels a little heavier and does, in fact, have about 4 grams more weight. Yet all that slick stainless steel and the glass back gives it a luxury feel that distracts you from the heft. But nothing can distract you from the 6.5-inch display. It’s attractive, it reaches nearly to the edge of the phone, and small-handed folks should beware. Gizmodo tried it out, and we found that it was simply too big. Our thumb couldn’t actually make it from one side of the display to the other, and it feels a little unwieldy. While the flick gestures for getting to the menus work fine for right-handed individuals, small-handed lefties are gonna be in for a world of strain. As far as how the Xs Max compares to its closest competitors, this is really a competition with Samsung’s Galaxy Note 9. We’ve listed some other major phones specs below for cross-reference, but nothing else is particularly close. Apple is winning the display war, edging out Samsung’s Galaxy Note 9 by a tenth of an inch. Overall, it’s actually slightly smaller than the Note 9 but 8 grams heavier. We have to give Samsung the edge when it comes to battery life, for now. We haven’t been able to do our own test of the Xs Max’s battery just yet but Apple stressed the fact that it’s the biggest battery ever sold in an iPhone and it holds a charge for “an-hour-and-a-half longer than the iPhone X.” Based on our own benchmarks, the iPhone X lasted 9 hours and 56 minutes on a single charge, so taking Apple at its word, that would mean that the Xs Max could stay charged somewhere between 11 and 12 hours. Our benchmark for the Note 9 clocked in at a whopping 14 hours and 11 minutes. All this depends on how the phone is being used, but you get the idea. Below you can see more specs and decide if you’re a tiny-handed human with a sense of adventure or a giant who has finally found the phone of their dreams.